A vigorous scrambling or climbing plant from Western Australia, Hardenbergia comptoniana is commonly called the Native Wisteria and is available in both purple and white flowering forms. 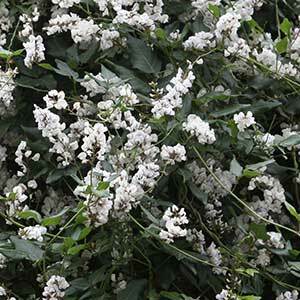 Pea like flowers in spring and deep green glossy foliage year round make this an attractive plant used either a climber or ground cover. 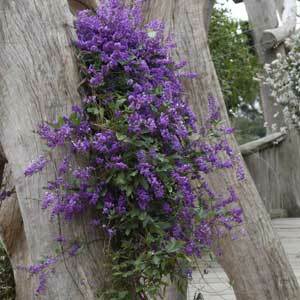 Use it as a screening plant for sheds and fences, or as a ground cover plant. Particularly useful for helping to cover and stabilise embankments or retaining walls. This is plant that will grow well in poor soils and is drought tolerant once established. It tolerates hot condition easily, requiring very little water, and generally does not require any fertiliser. The only maintenance required is to prune back to maintain an appropriate size and to tidy up after flowering. Height – Can be trained to climb to 3 metres. As a ground cover it owillreach around .2 metres.